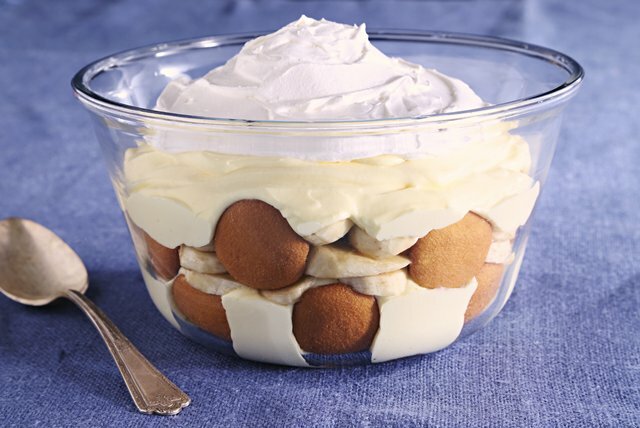 This creamy banana pudding dessert is one of the more scrumptious ways to show 'em some Southern hospitality—no matter where you're from! Pour milk into large bowl. Add dry pudding mixes. Beat with wire whisk 2 min. or until well blended. Let stand 3 min. Gently stir in 1-1/2 cups of the whipped topping. Refrigerate at least 1 hour before serving. Store leftover dessert in refrigerator. Trim 20 calories and 3 grams of fat per serving by using fat-free milk, COOL WHIP LITE Whipped Topping and reduced-fat vanilla wafers. Bananas ripen best at room temperature. To quickly ripen bananas, place the fruit in a brown paper bag and close the bag tightly. The fruit gives off a gas as it ripens. Containing the gas in the closed bag will hasten the ripening process. Place unopened 8-oz. tub of COOL WHIP in the refrigerator for 4 hours. Do not thaw in the microwave.